These instructions describe connection of the Black and White reverse osmosis unit to the permeate pump. Refer to the standard instruction sheet for installation of faucet, inlet valve, drain saddle, etc. Note: The instructions below pertain to installation on one of our Black & White reverse osmosis units that has been set up to operate with permeate pump. It is possible to retrofit existing units for use with the pump, but separate instructions are needed. Start by mounting the permeate pump to a wall near the main body of the unit. Be sure to observe the up/down arrows on the pump. 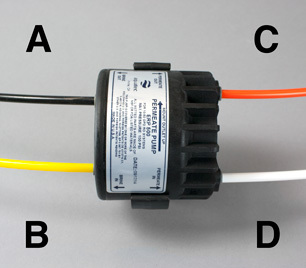 When the pump is securely mounted and the unit is in place, make the connections indicated below. Use plug-in-elbows provided if an elbow fitting is needed to prevent tube bending or crimping. The black tube is already connected to the “Brine Out” port of the pump. Be sure that the arrow on the white check valve points away from the pump. The open end of this tube will later be installed into the drain saddle. Connect the yellow tube to the “Brine In” port of the pump. Connect the orange tube to the “Permeate Out” port of the pump. Connect the white tube to the “Permeate In” port of the pump. No special instructions are needed for startup and operation of the pump. Just follow instructions for regular reverse osmosis startup and the pump will take care of itself. It is important that the pump remain at all times in the position shown for proper operation.